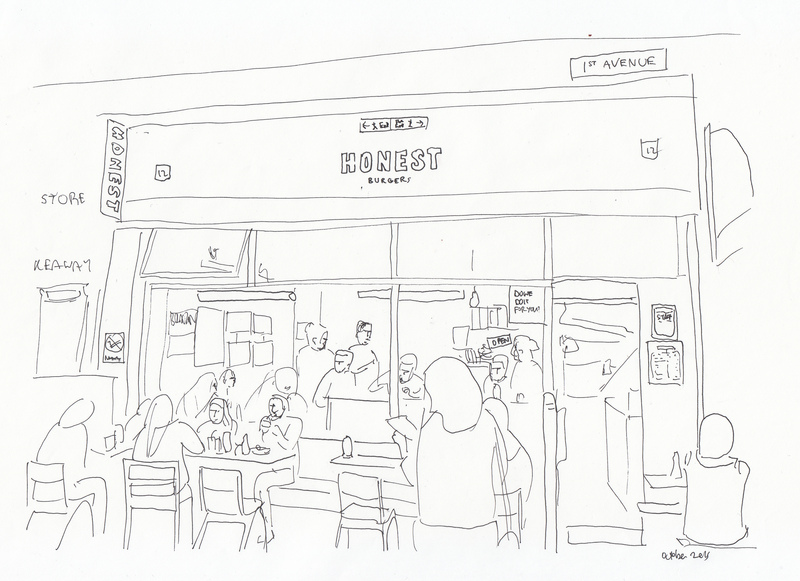 The first Honest opened in Brixton in 2011 – founders Tom Barton and Phil Eeles had set up a successful catering business in Brighton, then Tom moved to Brixton and the idea of Honest Burgers began to form. The pair teamed up with Dorian Waite, an experienced restaurateur who previously worked for Bills and Strada and the three of them set up a company, jumping at the chance to take a unit at the then rapidly gentrifying Brixton Village. They pooled together a total of £7,500 to get the restaurant off the ground and set up the kitchen in the little retail unit. Honest was an instant hit, opening at the beginning of London’s burger craze and receiving rave reviews from the burgeoning London blog scene. They opened a branch in Soho the following year, before securing a tidy £1m from Santander which financed outlets in Camden and Potobello. The Honest stable now boasts 10 restaurants and they have just raised £7m from a private equity firm, Active Private Investment, so expect further expansion very soon. They serve burgers and nothing else: you can choose from beef, chicken and veggie options (£7-11.75). The beef burgers are made from 35-day, dry-aged British steak from Yorkshire-based farm the Ginger Pig, which supplies seven butchers across London (there is one in nearby Clapham). I chose the Honest – a beef patty with bacon, red onion relish, smoked bacon, mature cheddar, pickled cucumber and lettuce – all for £10 including chips. Their patties are served medium rare as standard and mine arrived nicely pink. The steak mince was well seasoned though not overly salty and the burger had been rested before serving so it was succulent, but not bloody. The glazed brioche bun held up well to the juicy meat and the toppings all did their job, the slight sweetness of the red onion relish rounded things off nicely. Their chips are handmade in the restaurants, with hints of potato skin and seasoned with rosemary salt, served perfectly crisp they are probably the best chips I have eaten in any burger place in London. 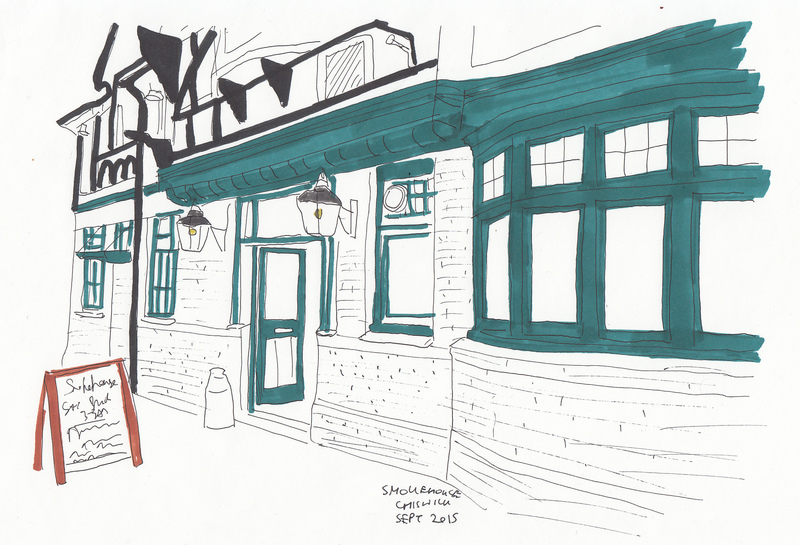 This is the sister restaurant of the wonderful Smokehouse Islington – it opened this April on the site of the former Hole In The Wall pub. It is another creation from precocious executive chef Neil Rankin (who I have already written up a little biography of here in my review of the original Smokehouse) and is part of the Noble Inns group which includes the Pig & Butcher and The Princess of Shoreditch. Their menu is similar to Smokehouse Islington but the beer selection is less interesting – possibly because of the more sleepy location they serve soapy country bitters rather than contemporary Bermondsey brews. This is definitely a place for barbecue geeks – they have a ‘Ole Hickory Pit Smoker’ and Robata grill process; the shortrib bourguignon has received some great write-ups. After a passable starter of potted shrimp with sourdough toast and a sub-par hake ceviche (both £7), we moved on to the main event – the Sunday roast. They offer pork (£16), lamb (£17) and beef (£18) all served with roasted carrots, parsnips & potatoes, broccoli, cauliflower cheese, Yorkshire pudding & gravy. We chose pork and lamb roasts – both were served in hulking portions, crowned with an impressive Yorkshire pudding. As expected, the quality of the meat was excellent and the cooking spot on – the pork had a bit more character than the lamb but I enjoyed both. The impending meat sweats were tempered by the good amount of veggies on the plate – the highlight being the slightly caramalised carrots. I was disappointing by the potatoes, which could have been crispier – I think they had been cooked earlier in the day and then reheated in the oven. The gravy was unremarkable but decent enough – it should have been thickened for a bit longer, but the cauliflower cheese was a real success: it was rich, sticky and decadently creamy. Categories: Barbecue, British, Burgers | Permalink.